The board gets quite hot and the Omap4430 reaches about 80ºC at heavy load with a room temperature of 20ºC. The processor's thermal specs are: TJmax = 105°C and TBmax = 85°C. Every change in the CPU load showed up almost inmediatly on the thermal camera. We tracked the heat of the hotspots to see the evolution graphically. Here is a video of the heating up process. One surprising thing we noticed is that after shutting down the system, the processor didn't cool, and stayed warm until we unplugged the board from the power supply. This issue may affect a system based on batteries, causing some draining. 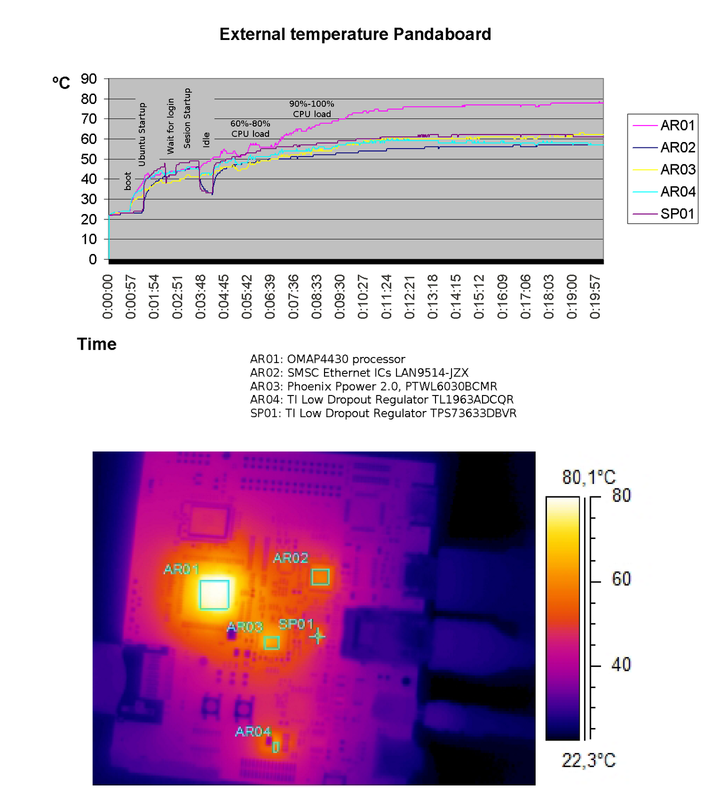 This can be seen in this video of the thermography of a small pasive heatsink attached to the processor.